Welcome to D-E Summer Connections’ Discoveries and Adventures 2016! Yesterday morning Adventures campers participated in Spirit Challenge by Team Makers who visited our campus for an exciting morning. Leadership, sportsmanship, and teamwork were the themes on this first official day of camp. Welcome to Summer Connections (SC) 2016! We are looking forward to an exciting and engaging summer full of fun and exploration! Our faculty and staff are eager to meet our newest campers and welcome back our SC family. We hope to make your child’s transition into the summer program a smooth one. Below are some things to keep in mind to make this transition as smooth as possible. This summer will be filled with adventures in art, music, movement, sports, culture, and memories for years to come! We can’t wait to get started! Information on teachers and specific group names are listed below. Scroll down for weekly updates from each one. For the safety of all of our campers and staff, we ask families and friends of families to refrain from entering the school building during the camp day. We will regularly host events for families to join us on campus. Supervised care begins at 8:15 AM. Our camp day begins at 8:30 AM. Drop-off and pick-up take place in front of the Lower School. Please do not drop off before 8:15 AM. Please do not exit your vehicle. Discoveries dismissal begins at 3:00 PM. Adventures dismissal begins at 3:15 PM. Maintain a single file car line to the right. The left lane must be kept clear for vehicles exiting campus. A car tag will be sent home with your child. Please indicate the child’s family name and group number on the car tag and display it in the windshield of passenger side. The driveway is a one way. Parking is prohibited in Lower School driveway. 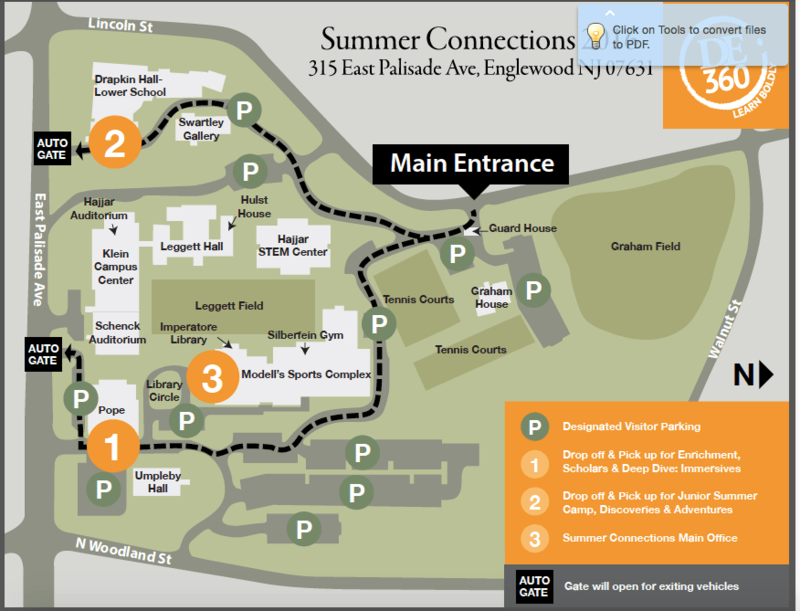 Please click here for a campus map. Please review all procedures with the person who is responsible for picking up and dropping off your child. Thank you, in advance, for your patience and understanding as families get adjusted to our pick-up and drop-off procedures. Forms must be up to date, completed, and submitted to the SC Office by the time your child arrives on campus. All forms are necessary, even if you child attends D-E during the school year. If you child requires medication during the day, please indicate that on the medical forms and hand medicine directly to our Health Director, Mr. Greiben Agramonte or the Lower School Nurse, Ms. Holly Alasio. Do not send any medication to camp with your child. Every day: Sunscreen, sneakers, water bottle, extra set of clothing, a book for Siesta. Water Play Days: Beach towel, bathing suit, water shoes, extra set of clothing. Do not bring electronics, money, valuables, or toys to camp. We will not be held responsible for lost or damaged personal property. Discoveries: Lunch may be purchased for $45 per week, $9 per day. All campers are welcome to bring lunch and/or snack from home. Adventures: Lunch is provided daily for Adventures campers only. On field trip days, a bag lunch is provided. If you choose to send a lunch from home, please use disposable containers on trip days. Discoveries: Cubbies are provided for Discoveries campers. They may store their Rest items, Water Play items, and any other personal items in their cubbies. They must be cleaned out each Friday, even if a camper is returning the following week. Adventures: Lockers are provided in the Lower School for Adventures campers. They may store their Water Play items, Siesta book, sunscreen, and other personal items in their lockers. They must be cleaned out each Friday, even if a camper is returning the following week. Please visit our Camp Store locations in the Library and the Klein Campus Center after camp hours with your child if you would like to purchase any souvenirs. Additional SC Blue Shirts are also available for purchase for $12 in the Lower School Office. Email adventures@d-e.org if your child will be late, absent, or leaving early. Please do not hesitate contacting us with any questions or concerns. We look forward to seeing you soon!